“I’m here today because of all of you and because of this conservative movement, and on behalf of the President, from the bottom of my heart, let me say thank you,” said Pence. 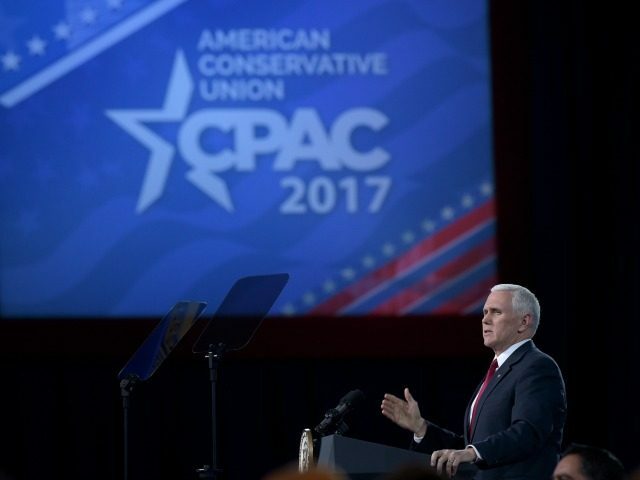 Speaking of the presidential election, Pence said, “the establishment never saw it coming.” He continued, “The media elites, the insiders, everybody else who profits off preserving the status quo, they just dismissed our President every step of the way.” He said that in doing so they also, “dismissed millions of the hard working forgotten men and women who make this country great” and that worse they are still dismissing those people. “This is still government of the people, by the people and for the people,” he proclaimed. “My friends, this is our time,” the Vice President continued. “Despite the best efforts of liberal activists in town halls across the country. The American people know that Obamacare has failed and Obamacare has got to go,” said Pence who then spoke of the high cost of healthcare. He spoke of premiums rising 25 percent under Obamacare in 2016. The Vice President vowed that Obamacare would be replaced with “something that actually works.” A plan based on “freedom and individual responsibility” and that the Trump administration would deliver an orderly transition out of Obamacare and to a plan that puts the American people first. He emphasized that President Trump’s position on life is one of the reasons he is most proud to stand with the President. He stated that their Administration would make the Hyde amendment permanent. Pence reminded the audience of Trump’s promise to nominated a Supreme Court Justice in the same tradition as the former Justice Antonin Scalia. “We gotta do what we did before. We gotta mobilize, we gotta march forward as if it’s the most important time in the history of our movement, because it is,” the Vice President told the audience.